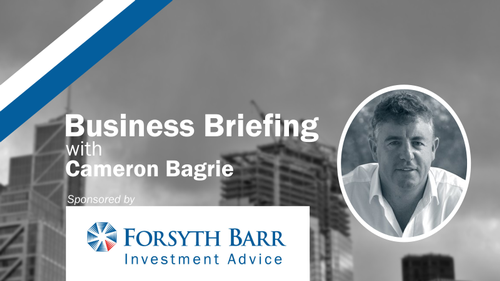 We're excited to be bringing back the Business Briefing Series, supported by Forsyth Barr. Our first speaker of the year is Cameron Bagrie. Cameron has been an economist for 20 years. For over 11 years he was the Chief Economist at ANZ, heading a team that was consistently ranked No. 1 for its analysis of the New Zealand economy. He developed a reputation for taking a forthright stand on even the hardest of economic issues. He’s also worked as an economist at the National Bank, Treasury and Statistics New Zealand. At ANZ Cameron took the team beyond commentary on the usual economic indicators and wrote extensively on everything from agriculture to banking and credit facilitation, key industries and Government fiscal policy. His approach to economics is pragmatic and non-ideological. Too much commentary focuses on what the Reserve Bank does while ignoring microeconomics and the wider economy. As a public speaker Cameron has a real talent for communicating complex issues in layperson’s language. Cameron holds B Com from the University of Otago and an M Com from the University of Canterbury.